Deluxe timing belt kit for the 2.7T Audi S4s, RS4s, A6s, and the Allroad. 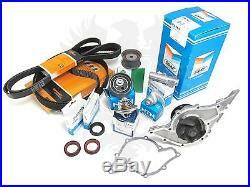 This kit includes the parts that should be replaced as part of a timing belt change. Continental Timing Belt --- 078109119J / 078109119C Ruville Tensioner --- 078109243S Tensioner Damper --- 078109479E OEM INA Idler Roller --- 078109244H Timing Belt Tensioner Lever --- 078109487C Water Pump --- 078121006A Serpentine Belt --- 6PK1856 2x OEM Elring/VR Cam Seals --- 068103085E/D OEM Elring/VR Crank Seal --- 038103085E Thermostat with O-ring --- 078121113F. Related Product: 1.5L G12++ Coolant (Backwards Compatible with all pink/red G12-based coolants). The displayed rates are a guide; individual rates vary by country. The item "New OEM Audi 2.7T S4 RS4 A6 Allroad Deluxe Timing Belt & Water Pump Kit'00-05" is in sale since Thursday, January 23, 2014. This item is in the category "eBay Motors\Parts & Accessories\Car & Truck Parts\Engines & Components\Timing Components". The seller is "cascadegerman" and is located in Gresham, Oregon. This item can be shipped worldwide.